Hubbell-Wiring Killark® Acceptor® Single gang UGR bladed receptacle has corrosion-resistant, copper-free aluminum alloy construction with electrostatically applied and baked powder epoxy/polyester finish. 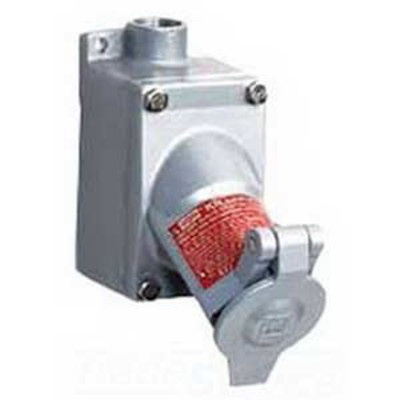 This receptacle operates at a voltage rating of 125-Volts AC and current rating of 20-Amps. It is suitable for petroleum refineries, chemical plants, wet/damp/corrosive areas and grain elevators/feed mills. The UGR bladed receptacle meets UL E91049 and/or E53660, CSA LR14667, Class I, Div. 1 & 2, Groups BN, C, D, Class I, Zones 1 & 2, Groups IIB+H2, IIA, Class II, Div. 1 & 2, Groups F, G, Class III, NEMA 3, 7 (B, C, D) and 9 (F, G) standards.